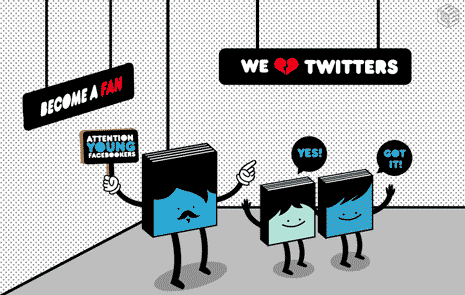 As I was preparing to publish my last post on the connection between writing and designing, I came across a short post by Justin Tadlock, On English: Twitter vs Facebook. Justin observed his Twitter friends are better able to craft grammatically correct sentences than his friends on Facebook. Justin further proposes the reason is that the 140 character limit forces you to think more about what you’re writing. It’s an interesting observation, but in many ways irrelevant where communication is concerned. Justin’s own posts shows why it’s irrelevant. Somewhat ironically his post arguing for the use of proper grammar is grammatically incorrect. I’ll let you check the post on your own to find the grammatical error. The reason the post shows the irrelevancy of its argument is that even while grammatically incorrect, it’s still easily understood. Edit: It looks like Justin has correct the grammatical flaw in the post. Originally it boiled down to “I have more friends on Twitter, while Facebook is” or something similar. Again the post was easily understood and the original still read fine. Aside: Since I’m picking on Justin’s grammatical error I should also point out he’s one of the foremost authorities on WordPress. His blog is one of my first stops when it comes to learning most anything WordPress and if you use also WordPress, but aren’t yet subscribed to Justin’s blog you should correct that right now. Here’s a direct link to the feed. Rules of grammar, whether literary or visual, should be seen as guides and not absolutes. It’s not what your teachers told you in high school, but it’s true. Language evolves. Grammar changes over time. What’s incorrect today will become correct tomorrow. What we know today as a comma descended from a slash. Before that it was a dot placed at a certain height. 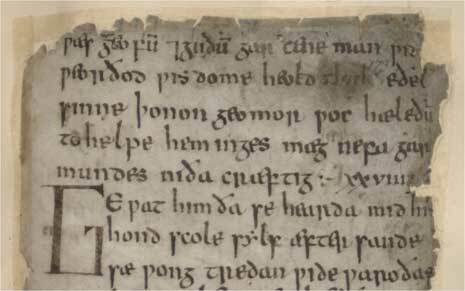 If you doubt language evolves have a look at Beowulf, written sometime between the 8th and 11th centuries. It’s written in English, albeit Old English or Anglo-Saxon. That we call it Old English should be enough to see that language evolves, but take a glance at the epic poem to see how much. The image above is a small part of the manuscript. It’s been estimated that Shakespeare invented over 1700 words as well as many phrases now in common use. The first time he used them they were grammatically incorrect by definition and yet people both understood and enjoyed his plays. Lewis Carroll wrote Jabberwocky, partially seen below, using several nonsensical words and yet the message of the poem seems clear. Whether you want to accept it or not, txt speak will likely become more grammatically correct in the future as more and more people grow up using it. It’s simply the evolutionary nature of language. Language exists to help us communicate. What’s important is that we’re understood, not that we do so according to a specific set of rules. You have a message to convey and as long as you get that message across you’ve communicated successfully. Whether or not the form of communication is grammatically correct is irrelevant. The best writers and designers break the rules of the language they use and in so doing advance the language. See Shakespeare and Lewis Carroll above or consider the Bauhaus who went against many of the “rules” of design that came before. You might think after reading the above that I don’t think it important to learn to use grammar properly. Quite the contrary. In order to break a rule you should understand the rule you’re breaking. You should have a reason for breaking it. The more we understand, the more informed the choices we make, even when the choice is to go against our own understanding. Rules of grammar are like standards. If we can all agree that a period marks the end of a sentence or that a space between lines of text marks a new paragraph we can better communicate with each other. It’s ok though to break from standards in some situations, especially where breaking from the standard makes things clearer. Think about coding a web page. We all know and groan about how Internet Explorer sometimes doesn’t honor standards. We’ve all had to write a hack or two to make something work in IE. Did it make us poor developers to write grammatically incorrect code? Not at all. That incorrect code simply helped us communicate with a specific audience. Still it was important for us to understand coding standards first in order to understand why something specific wasn’t working in IE and then to understand how to fix it without breaking the code in other browsers. Understanding as much as you can about grammar is important because it opens you up to communicating with a wider audience. In some places using proper grammar is a must. A resume comes to mind as does most formal business communication. Any form of professional communication calls for proper grammar. Anything less will be viewed as unprofessional. For fun I scanned my own followers and friends on Twitter and Facebook to see if either clearly wrote better than the other. While my scan was far from scientific there was little to suggest that what was written on one was better or more correct than the other. However I would agree with Justin that the character limit Twitter imposes will get some to put more thought into what they write by necessity. 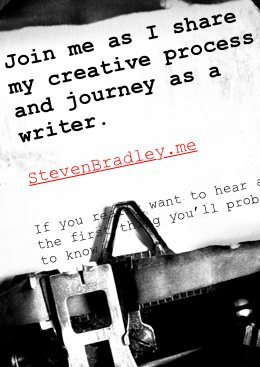 I don’t think it will have any great impact on the majority, but for those people interested in improving their writing, Twitter can help them get there. In many ways it’s the same as how constraints aid us in design. Our solution has to work within the limits set by the client. Two of my Facebook friends often wrote grammatically incorrect sentences. Those two people are cousins of mine who happen to be two of the most literate people I know. They’re probably two of the most literate people on the planet and both have been writers and editors their entire lives. One is even co-owner of a publishing company she helped found. I guarantee they write better than both you and I and yet here they are ignoring some rules of grammar in Facebook posts. Those posts were also among the clearest communication on either Facebook or Twitter, despite not being bound by every rule of grammar. Both Facebook and Twitter lend themselves to informal use of language. Neither is a place you should expect to see grammatically perfect posts or tweets. And from my informal scans neither tries to meet those misguided expectations. Grammar is important, but what’s more important is communication. If you can get your message across to your intended audience there’s nothing wrong with breaking grammatical rules. There are places and audiences where your grammar and general use of the language will be judged, so failing to learn the rules of grammar is a no no. Just because you don’t have to use those rules all the time is no excuse not to learn them. You will be able to communicate more effectively the more you understand the language, even if at times you ignore its rules. Keep in mind that while this post focused on written language, everything here applies to visual language as well. 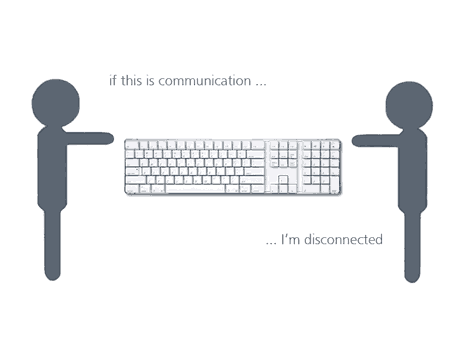 Learn the rules for communicating visually, but remember that those rules can be broken whenever it aids communication. I’ll close this post with the same recommendation Justin made in his post and suggest buying and reading a copy of The Elements of Style, by William, Strunk and E.B. White. It’s one of the best books you could ever read where learning to write better is concerned. And accept my apologies for any grammatical errors in this post. However, as long as the message gets through I don’t plan on fixing them. Great post. I completely agree with your analysis of grammar – the standards comparison is spot on. Chomsky teaches us that grammar should be descriptive rather than prescriptive. Frustratingly, many people see grammar as a restrictive force, inhibiting expression, when in fact the opposite is the case. A good grasp of grammar is a real asset, making a fuller range of communication and expression possible. Thanks Sue. I think I need to read more Chomsky. I like the quote. It sounds like we completely agree on this. Like you I think a good grasp of grammar is an asset and I also think we shouldn’t feel restricted by it. I think at times people forget the point of grammar is to help us communicate better with each other. They start to think that the grammar is the most important thing, forgetting that the point is to communicate not to strictly adhere to some rule. That was a deliberate error you added, wasn’t it? I’d have to know which error you mean before being able to answer. Given my poor typing and proofing skills my guess is it probably wasn’t deliberate, but you never know. Rather than thinking of grammar rules as prescriptive restrictions, I prefer to think of them as the boundaries of expression. If I write a sonnet, for instance, I know there is a certain format I must follow to write a sonnet. The “restriction” of the sonnet’s form defines it; if I stray outside the definition of a sonnet, I may have written a wonderful poem, but it isn’t a sonnet. Likewise with grammar: The rules define the boundaries of how I can say something–but not what can be said. Rather than limits, they are a challenge to express my thoughts within the rules of the language. Perhaps we should make a distinction between grammar–the rules governing syntax and expression–and usage. 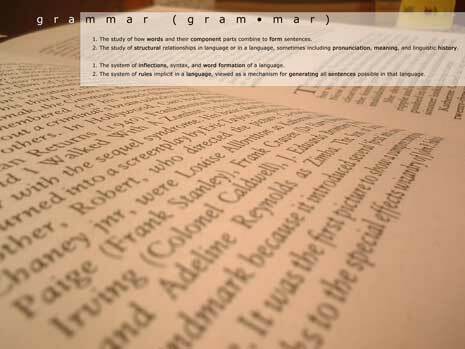 Grammar is essential to communication as it is the baseline level of linguistic communication. It’s the reason we can understand Shakespeare’s plays today: The grammar of Elizabethan English and modern English are close enough that we can still understand each other–but the usage is vastly different. I think usage is what changes most over time. Txt speak, as deplorable as it is, is shaping modern usage to the point that my otherwise very proper mother-in-law writes text messages with all the appropriate txtisms. Yet the grammar that governs the basic expression–the ordering of words, the little rules that make these random combinations of letters and spaces and punctuation make sense–remain, even if the lols abound. That’s an interesting way of looking at it. I like the distinction you make. Syntax of expression and usage are certainly two different things and it’s mainly usage where people push the limits to expand the language. is clearer and I still prefer to always include that last comma. The reason the post shows the irrelevancy of it’s argument is that even while grammatically incorrect, it’s still easily understood. Ahh. In that case then no it wasn’t deliberate. Just my fingers typing what they wanted instead of what my brain was thinking and then later failing to notice the apostrophe that didn’t belong. Please, if only for the sake of my sanity, point out the error I seem to be missing in Justin’s Tweet. The more friends called for a than comparison. There were several quick ways to fix and it looks like Justin chose using the than comparison. If you remove the” than on Facebook.” that’s there now and replace it with “,while” I think that’s how the post originally read. I’ll make a note in this post that it’s been corrected to prevent others from losing their sanity. All that aside, I agree with the concept of your post in general, and I think an analogy to coding is particularly apt: sometimes you can get away with coding something up in a slightly irregular way … other times, it breaks the message (read: site, app, plug-in, etc.) entirely. Thanks John. You can poke fun at any sentence you want. I make no claims to having good skills as either a typist of proofreader. Did I correct the error you were noticing? If so I’ll explain why I had what I had. There was a reason. If not I’ll have to look again at the sentence and find what I did. The coding analogy just popped into my head as I was writing the post. As soon as it came to me I thought it was a good comparison. Good to know at least one person agrees with me. This is a great article. It seems these days with all the popularity of texting and short abbreviations that proper grammer has become less used. True. To me it’s more about what’s appropriate based on who you’re communicating with and how you’re communicating. I don’t think it’s a big deal to use txt speak in an IM chat or on Twitter, but it doesn’t belong in a formal business letter or on a term paper. I think the problem is more that people aren’t being selective in where and how they break grammatical rules. Great article, that. As a boy reared on Shakespeare, Chaucer, Milton and the Bible I too find that many (particularly in South Africa, from whence I hail) today simply cannot spell and write correctly, to speak nothing of grammar and construct. I believe that in order to express oneself properly, such skills are a prerequisite – the more so if you happen to work in the media or related fields. I get angry when I hear and see people in the public eye speak shocking, grammatically incorrect English, because they appear before a vast audience and their inability to speak and enunciate properly has a knock-on effect. However, the modern generation and communications channels don’t exactly help this either, with text-speak being foremost amongst the offenders. It seems that if you use proper English your’e regarded as a freak (with apologies to that Henry Higgins fella). Subtitle: Cracking article, and some good food for thought. Thanks David. I agree that skill with the language is a prerequisite for communication. I don’t mind if people use colloquial speech in text messages or on twitter. It’s really about knowing where you’re communicating and who with. I don’t expect to use the same language with friends at the bar as I do around my mom. Where it becomes a problem is when people do the txt speak without understanding how to communicate in mediums where txt speak isn’t appropriate. your article is thought -provoking. 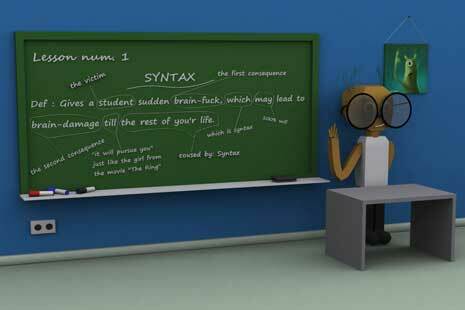 I am interested to know your views on syntax used by teachers teaching in professional institutions and whether it is an important factor in students’ career development or not important factor. I think if you’re teaching a class about grammar then you should teach the strict rules of grammar. I also think everyone should learn those rules as best as they can, though I don’t think you need to follow the rules 100% in all forms of communication, but you should know what the rules are before you break them.